It may be a hip and humorous pop culture catchphrase when Donald Trump says, “You’re Fired,” but I can only imagine that it’s quite a different story when it’s said to someone’s face in the harsh light of day and it’s probably significantly worse when it’s said to an unseen individual on a cellular phone when the person the speaker wants sacked is just two feet away. Such as the case for young technical assistant Julia Stiles who, coming from a delayed flight, arrives forty-five minutes late to provide visuals for her tough talking superior, businesswoman Stockard Channing as she fails to close a deal and wants the offending Stiles dismissed. Of course, to be fair, Channing’s Julie Styron is having a rough day after business strategizing leads her to believe she may be out of a job but her moodiness is improved considerably when the opposite occurs and she’s put in charge of the company. 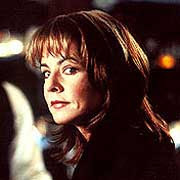 Stiles’ Paula Murphy, returning to the airport hotel after her flight is canceled runs into Julie (Channing) in the bar and is surprised to find the woman has not only changed her tune but tries to make it up to her with drinks and conversation which leads to a fast bond as the women begin a game of provocative questioning, power struggles, and escalating dare based camaraderie that increases with not only the more alcohol they consume but also the more they get to know one another. The darkly comical, cynically addictive set-up evolves into some far more devious and dangerous when a company head-hunter who’d arrived to try and help out Julie is spotted by Paula who had a horrifying experience with the young man years earlier and along with Julie schemes to get revenge that starts off teasingly and then grows more frightening as criminal activity is introduced. Nominated for the Grand Jury Prize at the 2001 Sundance Film Festival, The Business of Strangers was labeled by some critics as a female version of In The Company of Men. However, Strangers works not only on the level of a thriller but also even more so as a fascinating character study of business dynamics between women who’ve been in the male dominated industry for so long that they have plenty of battle scars which are exposed when they try to settle the score on headhunter Nick (Frederick Weller). Intriguingly, for me, not only did the film evoke LaBute’s Company of Men but also the equally diabolical writer David Mamet, with whom Julia Stiles has worked in a few of his pictures including State and Main and recently in the much darker non-Mamet directed Edmond based on his controversial play about evil lurking in the minds of men and no doubt the terrific Stiles learned a thing or two from Mamet that she applied for her Strangers role. The back-and-forth dialogue between Channing and Stiles feels sinister and hyper-real, revealing more to the audience with the subtext and the inflections and body language employed by the actresses who earned numerous nominations and a few accolades for their turns in this difficult film that plays even better with a repeat viewing in order to evaluate all of the verbal and nonverbal information being offered. Hard to shake once you've seen it, it's tough going but not a film you'd want to fire.